George Nēpia is considered to be one of New Zealand rugby’s finest players. He played all 32 matches for the famous 1924–25 ‘Invincibles’ on their tour of the British Isles, France and Canada. Yet over the next five years Nēpia appeared in only five test matches, playing his final match in the black jersey aged just 25. In all Nēpia played 46 matches for the All Blacks, scoring a total of 99 points. it is not for me a question of whether Nepia was the best fullback in history. It is a question of which of the others is fit to loose the laces of his Cotton Oxford boots. Injury and unavailability restricted his appearances for the All Blacks after this tour. Nēpia was also a victim of the New Zealand Rugby Union’s decision to bow to segregationist South Africa by selecting no Māori for the 1928 tour of South Africa. In 1935 Nēpia captained the New Zealand Maori team to Australia but having endured considerable financial hardship during the Great Depression he accepted a professional contract to play rugby league in England later that year. 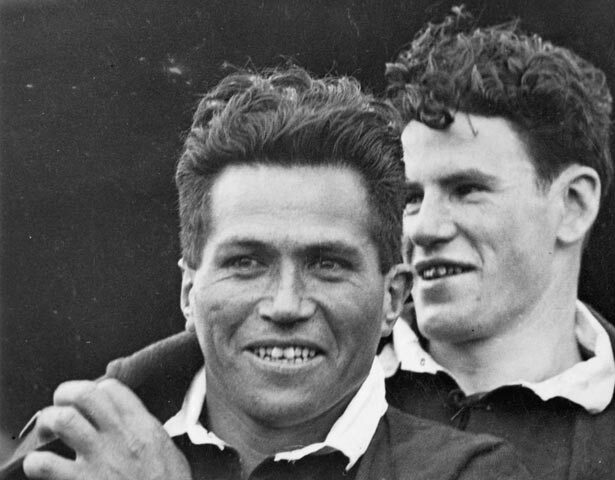 Missing his family, he returned to New Zealand in 1937 and was a member of the Kiwi side which pulled off a memorable 16–15 victory over Australia. Following a general amnesty in 1947 Nēpia was reinstated to rugby. He played a couple of rep games for East Coast and in 1950, now in his mid-40s, captained the Olympians club in a match against Poverty Bay. The opposing captain that day was his son George – this remains the only time a father and son have played against each other in New Zealand first-class rugby. Nēpia’s status in New Zealand rugby was best demonstrated shortly before his death in 1986, when – more than 50 years after his last All Black game – he was the subject of a widely viewed This Is Your Life television programme. The same year, the South African Rugby Board elected him as a life vice-president, a fitting honour from a country which he had never been allowed to tour. We have 12 biographies, 6 articles, related to George Nēpia.